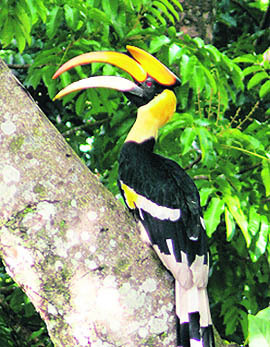 IT was heartening news for wildlife buffs and conservation brigades, besides the forest and wildlife staff of the Bodoland Territorial Council (BTC) of Assam, that the Unesco World Heritage Committee (WHC) has decided to restore the World Heritage Site tag on picturesque Manas National Park in Assam in its last conference held in Paris in June this year. The national park acquires its name from the magnificent Manas river that originates in Bhutan Himalayas and eternally gurgles through the sanctuary. Located at about five-hour-drive from Guwahati, the sprawling landscape of the Manas National Park attracted hordes of tourists, both domestic and tourists during the winter months. An elephant ride inside in the serene atmosphere in the park is a lifetime experience. Tourists are delighted to see peacocks crisscrossing their way while the deer would watch you from a safe distance. The uniqueness and grandeur of the Manas National Park had provided enough reasons to Unesco to bracket the core area of the wildlife sanctuary as a World Heritage Site in 1985. Manas National Park is unique because it is the only wildlife protection area in the country which has got five different conservation statuses — tiger reserve, world heritage site, biosphere reserve, national park and an elephant reserve. Manas is arguably the only wildlife habitat which harbours more than 20 Schedule I species as listed in the Wildlife Protection Act of India. Among the five Natural World Heritage Sites in India, Manas fulfils maximum three criteria for the coveted tag compared to other four World Heritage Sites that fulfil only two criteria each. The rest three Natural World Heritage Sites in India as enlisted by the Unesco include Kaziranga National Park, Sundarban National Park, Keoladeo National Park and Nandadevi and Valley of Flowers National Park (Nandadevi Biosphere Reserve). Unfortunately, a phase of extreme turmoil was let loose on this virtual paradise on earth by the Bodo militants, who converted it to their sanctuary because of its proximity to the Bhutan Himalayas, then a base of insurgents. As a result, Park’s treasure trove of wide range of flora and fauna were subjected to mindless destruction during turbulence in the Bodo-dominated areas in the late 1980s and 1990s. The situation inside the wildlife protection area turned so bad that Unesco was forced to mark Manas as a Heritage Site ‘in danger’ in 1992. The basic reasons given were political instability, loss of natural heritage and decline in the protection, damage in infrastructure and management of the park. Once normalcy was restored in the area in the wake of signing of the Bodoland Peace Accord between the Bodo Liberation Tiger (BLT) and the Government of India in February 2003, the park authorities could once again focus on restoring Manas to its past glory. The Bodoland Territorial Council (BTC) has now gone on an overdrive to rejuvenate the park. The BTC administration, along with the forest and wildlife officials, worked on a war footing in the Manas Reconstruction Programme. Manas has witnessed a turnaround in its fate in less than a decade. Rhinos have been reintroduced in Manas through translocation under the Rhino Vision 2020 Project. Elephant and wild buffalo populations have attained stability. Population of the hispid hare, pigmy hog and Bengal Florican has added to the uniqueness of the wildlife protection area. The presence of lesser-known rare species like the white-winged duck and Manipur bush quail has also been re-established here. There have been renewed efforts to conserve the endangered tiger in the Manas landscape that has been nurturing a tiger reserve since 1973. Prominent green brigades that played key roles in helping Manas regain its lost glory included the WWF, International Rhino Foundation (IRF), ATREE, the WWT, the WTI and Ecosystem-India and Aaranyak. BTC’s executive member in charge of forest and tourism Khampa Borgoyari said, "With the restoration of the World Heritage status by Unesco, we are now looking forward to greater cooperation with the management of the Royal Manas National Park across the India-Bhutan border. A strategy is being worked out for facilitating eco-tourism in and around Manas." 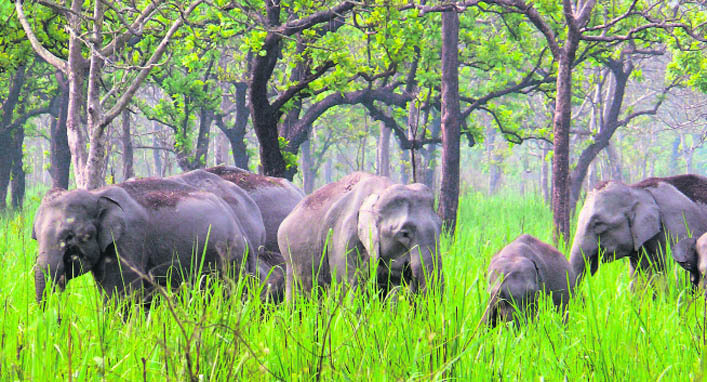 "That Manas National Park has risen from the worst phase to the present stature and regained its Word Heritage Site status speaks volumes of how concerted efforts involving government authorities, NGOs, local communities can work wonder for the conservation of wildlife habitats," said Dr Bibhab Talukdar, a noted wildlife biologist and secretary general of Aaranyak. A report of the International Union for Conservation of Nature (IUCN) also noted that Manas has made good progress and there was some evidence that wildlife population was beginning to recover. An IUCN-Unesco mission had visited the park early this year.